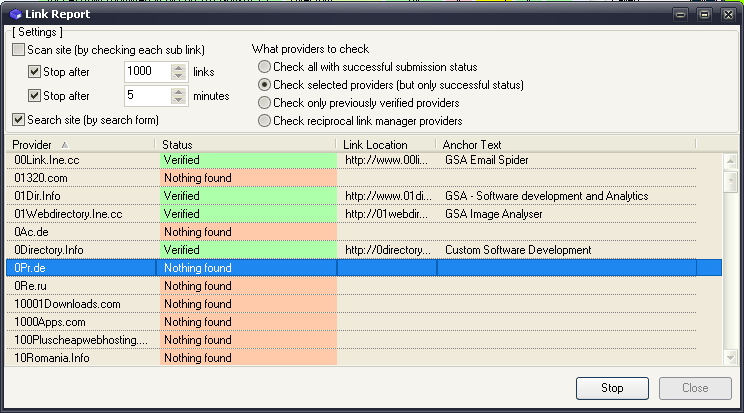 Once you are done with the submission, you still don't know if your software actually appears on the site or not. And its a pain to open all the providers URL and search for your link. You can now automate that as well with Main Menu → Tools → Link Report. It will try to search for your link with two methods. One is using the providers own search engine, the other will spider the whole site and check each link and sub category. After you finished this, you can correct the submission status or remove the providers from your reciprocal link manager when using the right mouse button on such a provider.